Thank you! I'm no professional, I just like playing with buttercream and sweets! I will prepare my brief! I can see this being a good one!!! Brilliant, I love the bright colours and variety of styles. Wowo.... I love these... so colourful and gorgeous! Can you run a decorating course so I can learn too? I'd love to! I'm just not sure that anyone would come! Thanks ladies! A lot of love goes into each little cake! I'd come! They're amazing- well done you. Busy weekend! Haha thanks! His sister is already writing her brief for me! The kids must have love them! The look too nice to eat. Great decorating skills! 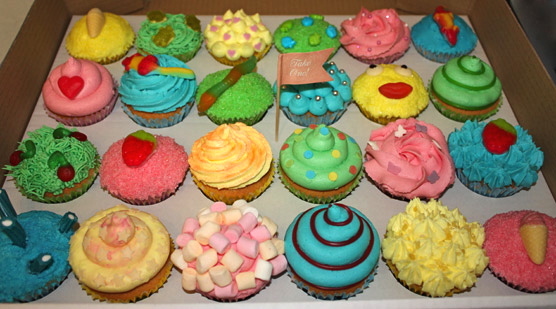 Very luvly cupcakes. Can I have some? Oh, I nominated you for the Versatile Blogger Award. Haha I think the kiddies I make them for demolished them in about 20 seconds flat! Oh! I can imagine that!